No Home Run is Greater Than His Sacrifice! I wanted to share one of my favorite Christmas presents with you. 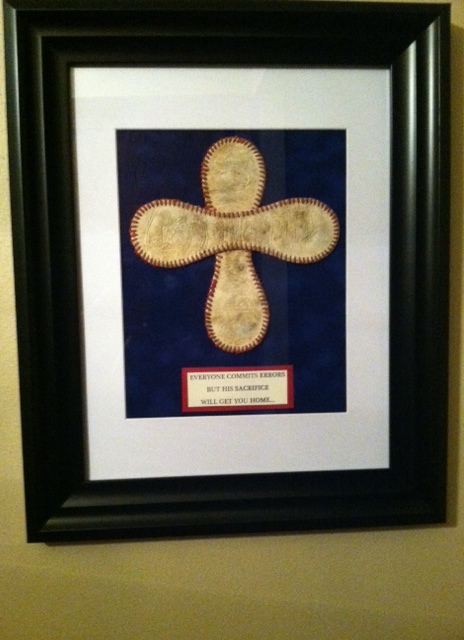 This a very unique baseball cross made out of one of my old baseballs. This plaque that my mother made, helps me to remember to always get over errors and leave it all on the field. It reminds me to “give thanks” to God and to my family. It encourages me to become a better teammate, to listen to my coaches, and be a good sport. I like to live by the motto: “God, Family, Baseball.” God always comes first. What I see is that God has a massive hitting streak going (all the gifts he has so generously given us). It’s game seven of the World Series against all evil. God understands that we make mistakes and always will, which are our errors. He forgives us for the BIG errors, and we should forgive ourselves for mistakes, learn from them, and move on. With a runner on third, a sacrifice bunt will win the World Series, but what if Jesus only needed a hit to break a record? To save his team (the world), he sacrifices! He sacrifices to save us all!!!! We all need to remember this each and every day. So whatever your beliefs, have FAITH. It will get you further than any home run. February 3rd, 2014 8 Comments	MLB Today	David S.